BSG Deadlock - Dev Diary #6 "The Broken Alliance"
Attention, nuggets! By now, you should have all the intel on our next DLC, The Broken Alliance, and the accompanying free update. We look forward to finally sharing everything we’ve been working on, and hope to see some more great stories from the First Cylon War from you all. We’ve already revealed some big new features in the upcoming patch, but today let’s talk about some more that we haven’t yet had a chance yet to talk about! These features and upgrades will be available to all players as of the patch release. A long awaited request from many members of the community, the Blueprint screen has beengiven a significant update! To start with, under the wireframe we have the basic data; hull points, armour and available slots. Easy on-hand information to determine which ships have the better armour ratings, and which units provide the firepower or squadron support. 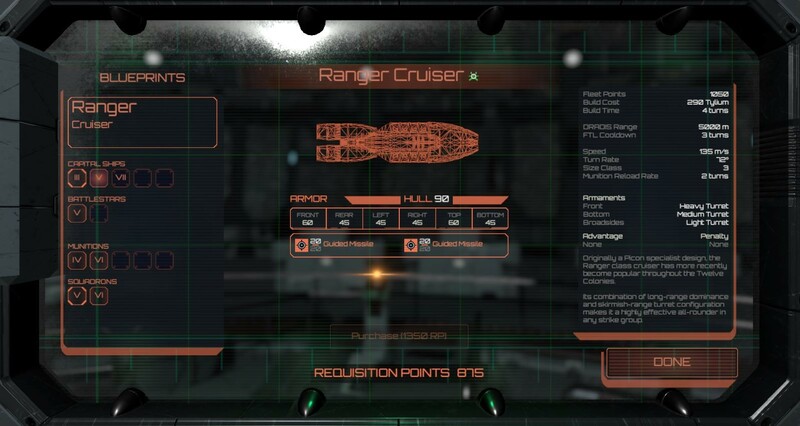 However, it’s the new information panel on the right that gives us the deep dive on each individual ship. Here we display a breakdown of every bit of info a Commander needs, including build data, turret battery placements, and a quick reference for all of the unit’s unique subsystem advantages and penalties. We’ve updated the war room table and surrounding UI elements for usability and functionality. The highlighting system is now more intuitive; the Planet Info UI has had some of its troublesome elements refactored for easier reading; and perhaps most importantly, the little fleet pieces move across the table! It’s now much easier to track fleet movements each round, and plan out your strategy for the Twelve Colonies accordingly. Two new abilities have been added to existing squadrons from the base game. Colonial Raptor Squadrons will now have the ability to board enemy ships; and the Cylon Wardrivers can actively jam the area around them. Similar to the Heavy Raider, the Colonial Raptor board command deposits a team of marines on the enemy ship, which starts the process of boarding combat. Unlike Cylon centurions, however, the Colonial marine squadrons are accompanied by an ECM tech team that use their proximity to the enemy to wreak havoc with their systems. While an enemy ship has a Colonial marine presence on board, the ship suffers penalties to subsystem repair speed and turret accuracy. Additionally, if the enemy is a Cylon ship, the tech team can disrupt the core processing system, effectively reducing the amount of energy the ship can distribute between subsystems. On the other hand, Clothos has been improving the field ECM technology of the Wardriver units. While not hacking, these agile tech utilities can activate jamming mode, which disrupts the navigation systems of all hostile squadrons in its local area. Additionally, the Wardriver can attempt to hack any guided munition that enters its jamming radius, giving it a chance to redirect the munition back at the cruiser that originally launched the missile. That’s everything for now, nuggets. We can’t wait to share all of these updates with you, and appreciate your patience. So say we all!